On Saturday I stepped back in time when I was taken to the Bermuda Aquarium Museum & Zoo by two of my children. The last time I went to the Aquarium, you were issued white, hand-held audio guides to talk you through a walking tour. I guess with the recession that is now out of the equation. As we walked around, we viewed various forms of marine life: colourful fish, eels, shellfish and coral formations. I often wonder if fish have emotions and whether they know that they are trapped in an aquatic cage instead of roaming free around the world. What caught my attention was the detailed explanation of the life of coral and the descriptions of the different types of coral. Sea Plumes are soft corals whilst Brain Corals are hard corals. As a child, I grew up thinking that coral reefs were simply a rock and not a living, breathing, reproducing organism. I have recently learned that in the Caribbean islands of Jamaica and the US Virgin Islands, the coral reefs are on the verge of extinction. Not because of nuclear waste or seabed mining but because of the loss of significant numbers of parrot fish. Apparently, parrot fish are an integral part of the life cycle of the reef community. They spend ninety per cent of their day eating the parasites and algae that, if left unattended, would destroy the coral life. 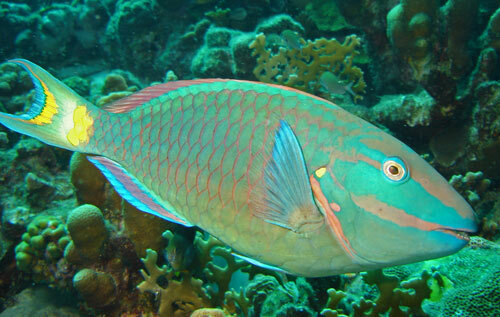 So once parrot fish are removed from the equation, the parasites and algae are left to destroy the coral reefs. Luckily in Bermuda, we have had stringent laws that protect parrot fish for a number of years. Time to hug an environmentalist. For those who fish, please kill all the lionfish but leave the parrot fish in the water. We can find symbolism on our reefs: the vital need for balance. So we are down to the final four in The World Cup. Argentina defeated Belgium 1-0, sending Mr Kompany and the guy with the afro hair home without a cup. Then came the Match-of-the-Day between the David and Goliath of the quarter finals: The Netherlands versus Costa Rica. This game was one that had my mother, father, two of my sons and one of my daughters literally sitting at the edge of the couch. We sat and watched a scoreless game for 90 minutes. 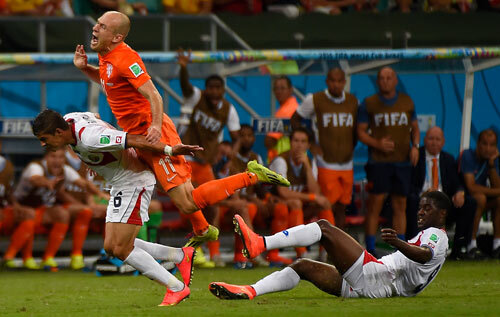 Despite how many swan dives or “belly-busters” Mr Robben took, he could not score a goal or win a penalty. Despite several open goals, Mr Van Persie seemed only content with hitting the goal post itself instead of the net. The irony was that the Netherlands controlled seventy per cent of the play but just could never finish. The game then went into 30 minutes of extra time, which again resulted in no score whatsoever. So the game went to the dreaded penalty shoot-out. It would seem as if the entire world was tuned in to who would score and who would save. Despite the wishes of many around the world, Costa Rica missed two penalty shots and thus were eliminated from the tournament. Holland, on the other hand, were exposed as lacking the ability to finish. That may prove pivotal in their game against Argentina today. I am no fan of Lionel Messi but for the sake of small guys in South and Central America, I hope he sinks at least two into the back of The Netherlands’ net.